Brighten up the neighborhood with classy, creative, and fully customized exterior shutters on your home. Duke Shutter Company in Acworth, GA, offers prompt and affordable exterior shutter installation services. Our window shutter company helps you go from bland to grand by creating the perfect exterior shutters for your house. Whether you are selling your home or giving it a makeover, we offer affordable and unique options that deliver the look you want. 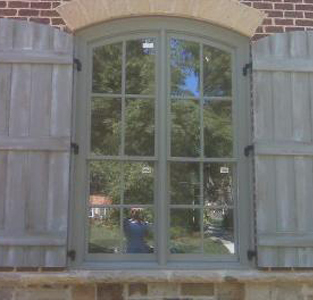 From wood to vinyl to composite, our exterior shutters come in all forms. You may be able to buy off-the-shelf shutters from a big box store, but they won't provide the customized look you want. We offer reasonably priced custom exterior shutters that last for a lifetime. Our Acworth, GA, team fabricates the highest quality shutters based on the style, color, and size you need. The options are endless. You don't want crooked shutters on your home. Turn to our exterior shutter installation experts in Acworth, GA, for prompt and accurate services. As soon as your custom exterior shutters are ready, our team is equipped and available to install them. Whether you want decorative or functional shutters, we handle any type of installation. From start to finish, we provide comprehensive services that ensure your 100% satisfaction. All you have to do is sit back and relax, because we'll take care of everything. Contact us for more information about our unique designs and affordable prices. We proudly serve customers in Acworth, Kennesaw, Canton, Woodstock, Marietta, Smyrna, Dunwoody, Johns Creek, Alpharetta, and Roswell, Georgia.